Big Bucks, No Whammys! 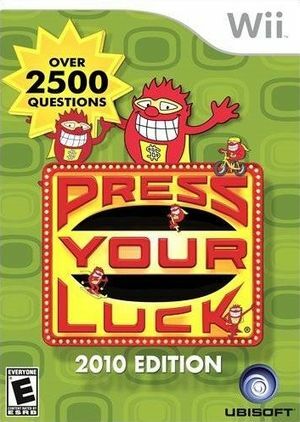 The cult classic game show makes its video game debut on the Wii in Press Your Luck 2010 Edition. Contestants collect "spins" by answering trivia questions, and then use their "spins" on an 18-space game board full of cash and prizes. The person who amasses the most in cash and prizes at the end of the game wins. Watch out for those famous Whammies along the way, they will steal all of your cash and prizes. Sometimes image tiles seem to be rendered 1px off, leaving small gaps or improperly drawn tile edges. This occurs even with 1x Internal Resolution and Anisotropic Filtering / Anti-aliasing off. Refer issue 6833. This is due to various texture interpolation issues and may happen on a real Wii. This may not occur with PAL releases. The display window will flash wildly unless XFB is enabled. Fixed with Hybrid XFB in 5.0-5874. The graph below charts the compatibility with Press Your Luck 2010 Edition since Dolphin's 2.0 release, listing revisions only where a compatibility change occurred. This page was last edited on 28 May 2018, at 00:36.